Add Bluetooth wireless technology to your desktop or notebook at a fraction of the size of normal Bluetooth USB adapters. Connect wireless Bluetooth dongle to available USB port to easily access all of the latest Bluetooth devices, such as cell phones, PDAs, mice and keyboards. Also features Bluetooth EDR (enhanced data rate) technology for transfer rates 3 times faster than traditional Bluetooth 1.1 and 1.2 adapters. Provides encrypted link security. Add up to seven wireless devices. A Simple Solution To Enable Your Computer to Communicate With Bluetooth Enabled Devices Such As Mobile Phones, Printers, Bluetooth Headsets and Bluetooth Speakers. Newest Bluetooth Smart Ready Adapter with low energy technology. (Also Backwards Compatible with Legacy Bluetooth Equipment). 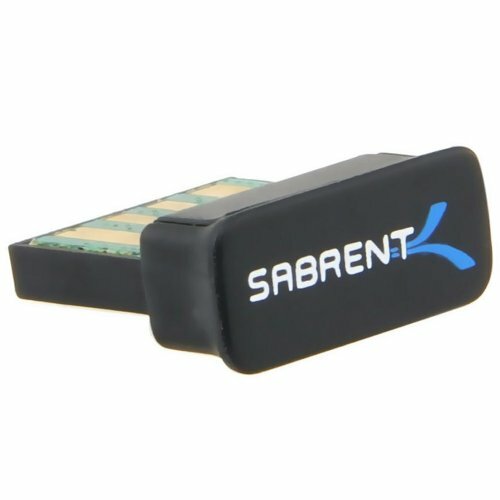 Bluetooth USB Adapter creates cable-free connections between your PCs and other Bluetooth devices such as Bluetooth Keyboard or Mouse at speeds of up to 3 Mbps.